Paradise just got closer with Kali Zoe at Ariel Dunes II, unit 609! This beautiful 2 bedroom, with additional bunk room and 2 bathroom condo offers amazing views, a great location, plenty of space for entertainment, a full-size stackable washer/dryer and a gorgeous balcony! The condo was recently updated with new furniture and paint as of January 2019. 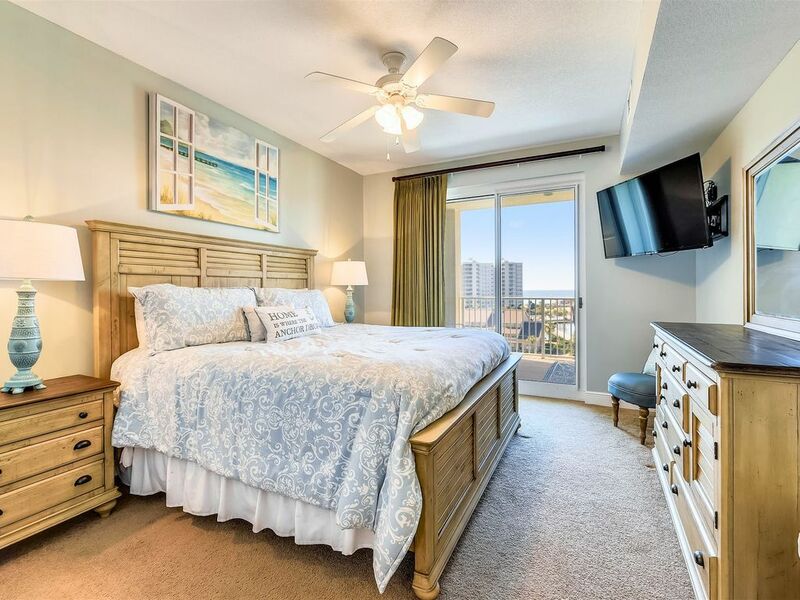 The Master bedroom features a King sized bed and even has a private entrance to the spacious balcony, allowing you to see the incredible views of the gulf, pools and lake! Make your way to the Master bathroom to enjoy the relaxing garden tub, walk in shower with over-sized shower head and double vanity sink! The living/dining room area is an appealing and inviting space that presents a nice home feel. The brand new living room furniture features a comfortable sleeper sofa and two swivel chairs. Next is the guest bedroom with a Queen size bed and shared bathroom access to the hallway. "The best days are the beach days" in the adorable Bunk room that has a cozy bean-bag chair and beach books your kids will be sure to love! The fully equipped kitchen features granite counter tops and medium wooden cabinets stocked with everything you need to cook you favorite meals with ease. We have recently added a brand new dining table and chairs to the balcony, making it the ideal outdoor living space! Nothing is better than enjoying dinner with these stunning views and feeling the ocean breeze! Just wait till you see these views at night! Your perfect vacation spot awaits you! Ariel Dunes is a signature beach complex with two towers inside the gated Seascape Resort and best of all, only a 4 minute walk to the beach! You will also find over 12,000 square feet of pools sprawled around Ariel Dunes and Ariel Dunes II has 3 pools totaling over 11,000 square feet! Come spend your next vacation get-a-way at Kali Zoe! The property was beautiful!!! My family had an awesome time in the swimming pool as well !!! Will definitely rent this unit again next year for spring break !!! Great welcoming feeling. Clean and warming atmosphere. Lovely place. Great spacious dining room. Thank you so much for taking the time to write us a review! We are so happy you enjoyed this lovely condo! The homeowners are making many upgrades and really putting a lot of love and care into this condo. We hope to have you back for your next vacation here! Remember to check out the Happy Guest Perks we offer at Forever Vacation Rentals! Yes, we think the location is perfect too with it being located off Scenic Hwy 98 with easy access to beach, beach and more beach. Contact us for your next trip to the beach and mention your were a happy guest. We had a great experience there! Very close to the beach, restaurants, night clubs and about a 10 minute drive from the Destin Harbor! The place was very clean and had a cute beach them! We could see the beach from our balcony! We will definitely book again when we come back!